Three years ago, the city of Denver set a rather lofty goal: eliminate traffic deaths in the city by 2030. Three years later, traffic deaths have increased, though a group that advocated for pedestrians, cyclists and drivers says the city is making some progress. DENVER — Three years ago, the city of Denver set a rather lofty goal: eliminate traffic deaths in the city by 2030. Three years later, traffic deaths have increased, though a group that advocated for pedestrians, cyclists and drivers said the city is making some progress. The Denver Streets Partnership released a report card on the city’s program, called Vision Zero. Overall, the group gave the city a C grade. “They did really well when it comes to bike lanes and operational improvements around intersections, but missed the marks when it came to sidewalks, when it came to traffic lighting and when it came to traffic calming – slowing people down,” said Danny Katz, director of Colorado Public Interest Research Group, or COPIRG. COPIRG is a member of the Denver Streets Partnership, along with Walk Denver and Bicycle Colorado. In 2018, 59 people died on Colorado roads, the second highest total in the last 15 years, according to Katz, and the most since the city’s Vision Zero program began in 2017. As part of the program, Denver set out to build 20 miles of new bike lanes in 2018. By December 31, public works crews had built 19 new miles, earning them an A in that category on the group’s report card. But according to the city’s plan, the goal is to build 14 miles of sidewalks each year. The city built about six miles in 2018, earning an F in that category. “A lot of what we’re seeing… is that these deaths are preventable. This is stuff that…we have designed our streets in a way too often to prioritize vehicles, to prioritize speeds and when you design streets that way you’re going to have unacceptable preventable deaths,” Katz said. During a news conference on the report card on Tuesday morning, organizers pointed out a positive of the project – a new pedestrian refuge and specialized crossing in the Montbello neighborhood, which has long been plagued with sidewalk problems. Pam Jiner was also at the news conference. Jiner has spent the last few years speaking out about the condition of sidewalks in Montbello. Pam Jiner has spent the last few years speaking out about the condition of sidewalks in Montbello. “We need to start to educating our drivers to slow down… watch out for pedestrians…you know let them cross the street,” she said. She is impressed with the progress she’s seen so far. 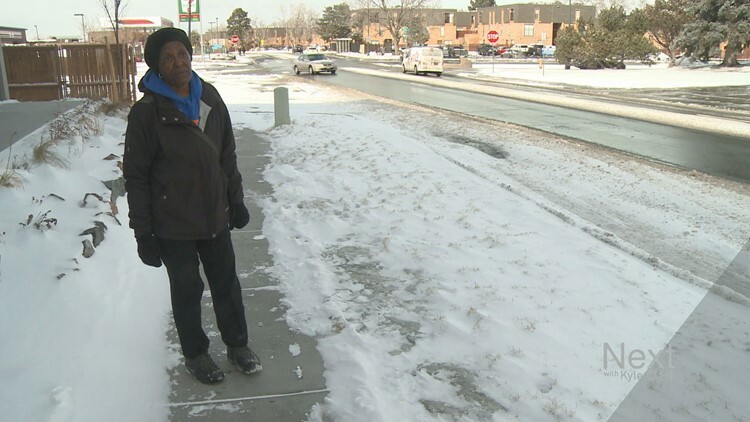 But she agrees there is much more to be done to improve the conditions of the roads in her neighborhood, where drivers often cut through to avoid I-70 traffic. “Something is better than nothing…at least they’re making baby steps toward making these major obstacles fixed,” she said.